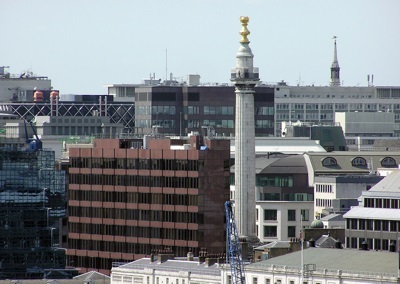 The Monument to the Great Fire of London, more often known simply as "The Monument", is a very large column-type monument in London. The Monument's column is a 202 feett (61 meter) high and is topped by a golden urn of fire. It was designed by Christopher Wren and Robert Hooke, and was intended to commemorate the Great Fire of London, which destroyed much of the city during a 4 day period in 1666. Additionally, it was also designed secondary purpose in mind; as scientific instrument. When constructed it was also intended to be used as zenith telescope, and in gravity, pendulum and pressure-measurement experiments. The Monument can be climbed (using an internal winding staircase) when it is open. Although it can be quite a daunting climb, visitors who try, generally do feel it is worth the effort. Potential visitors should however note, that The Monument does periodically undergo refurbishment, and may be closed for long periods (for months or sometimes for years) when this is occurring.